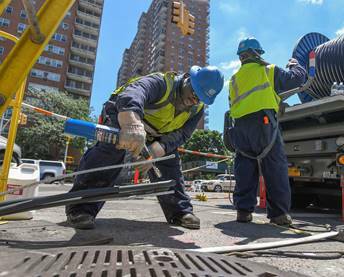 As the heat wave rolls into the work week and the demand for power increases, Con Edison is offering tips to help customers stay cool and save on their energy bills. The company has crews ready to respond to any power outages that occur during the extreme heat. Customers who report outages will be called by Con Edison with their estimated restoration times as they become available. Stay on top of outages and power problems by signing up for text notifications or by viewing the company’s interactive online outage map. To sign up for text alerts, go to conEd.com/text. · Set your air conditioning to the highest comfortable temperature. Every degree you lower the thermostat drives up your bill by 6 percent. · When the AC is running, close doors to keep cool air in and hot air out. · Even when using AC, use ceiling and other fans for better circulation. · Keep shades, blinds and curtains closed. About 40 percent of unwanted heat comes through windows. · Turn off ACs, lights and other appliances when not at home and use a timer or smart technology to turn on your AC about a half-hour before arriving home. · Keep AC filters clean. · If you run a business, keep your door closed while the AC is running. Don’t burn through your profits to cool the street. · To reduce heat and moisture in your home, run appliances such as ovens, washing machines, dryers and dishwashers in the early morning or late at night when it’s cooler outside. · Charge electric vehicles during off-peak hours. EV owners can earn up to $500 a year in rewards and get valuable information about their driving and charging habits by enrolling in Con Edison’s SmartCharge New York program. Customers should also consider replacing old appliances with new energy efficient Energy Star appliances. Replacing an old air conditioner with a new Energy Star unit can reduce energy usage by 30 percent. Con Edison will pay a $30 rebate to customers who buy a new ENERGY STAR air conditioner.